LABIATAE. 'BASIL'. Aromatic tender annuals grown in the herb garden for their value as seasoning and fragrance. The leaves are widely used in sauces and soups, the flavor blending particularly well with tomatoes. The clove-like fragrance has been considered soothing, and a cure for nervous headaches. Basil tea is said to calm an upset stomach. Start seed indoors 6 - 8 weeks before last frost, and plant out after all danger of frost is past. Thin to 6" apart. Basil likes full sun, and all types do well in pots. Harvest fresh leaves anytime. For drying, cut just before it reaches full bloom. Seed viable 8 - 10 years. Germinates in 1 - 4 weeks. 'LIME BASIL'. Has a zesty lime flavor. Compact bushy plants with small, intensely fragrant leaves. Perfect for window-boxes and borders. Germinates in 1 - 3 weeks. Flavorful Thai basil with an anise-clove flavor. To 14", with attractive dark flower spikes. AAS 1997. Germinates in 1 - 3 weeks. Round bushy plant to 2 feet, with long spikes of white flowers and small leaves with a strong camphor scent. Tropical Africa and Asia, this type from Malawi. Many medicinal uses in Africa, and used as a mosquito repellant and to protect stored grains. Germinates in 2 - 3 weeks. Light and KNO3 helps. Pink-purple flowers and deep green leaves on a tender woody shrub to 2 feet. Strong pepper scent. Germinates in a week. 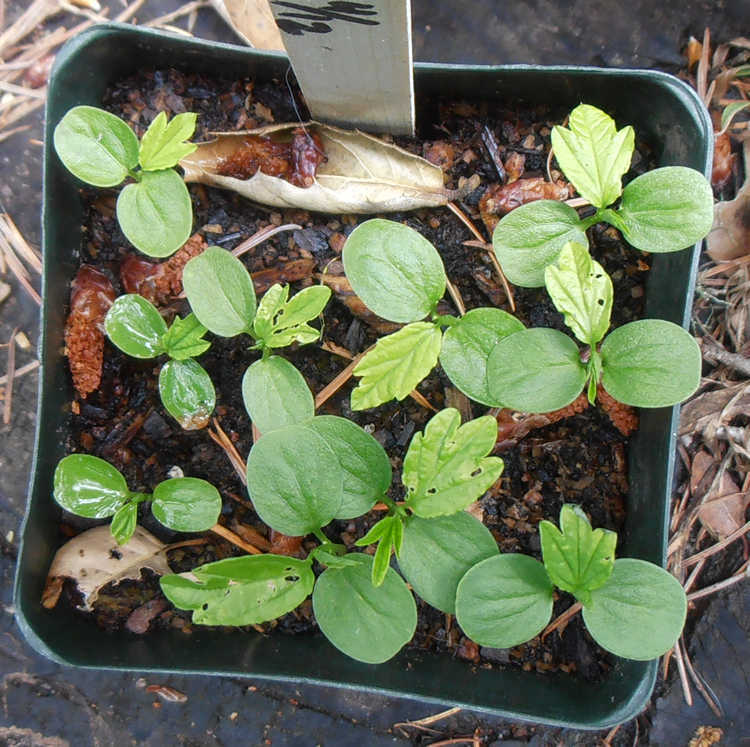 Ocimum kilimandscharicum cultivation in Kenya. 'KAPURI TULSHI', 'CAMPHOR BASIL'. White to light purple flowers. Tender shrub to 6 feet, with grey-green leaves with a strong camphor scent. E. Africa. Attracts bees. Used as a tea and medicinally in Africa and India. Germinates in 2 - 3 weeks. 'HOLY BASIL', 'TULSI'. Sweetly fragrant bushy perennial to 1 - 3 feet, grown as an annual in cold climates. Profuse purple or white bloom, and sometimes purplish-tinted foliage. Tropical Asia. Held sacred by the Hindus and grown around temples. Sections of the stem-bases are used in rosaries. The leaves are used in salads, and the oil is an effective antibiotic, and the leaves are used medicinally. Nice, distinctive clove-like flavor, good in cooking, salads, or for tea. Good in herb breads and herb butters. Good bee plant. Germinates in 1 - 4 weeks. Light and KNO3 helps. Organically grown. 'KRISHNA TULSI'. Sweet clove-like scent and taste. Tender perennial to 3 feet, with reddish purple leaves. Highly valued adaptogen in Ayurvedic medicine. Germinates in 1 - 2 weeks warm. ONAGRACEAE. 'EVENING PRIMROSE', 'SUNDROPS'. Showy, sun-loving plants valued for their bright yellow, rose or white flowers. A large and wide ranging group of annuals, biennials and perennials, generally preferring sunny dry open ground. Easy from seed in ordinary soil. Start in March, germinates in 1 - 3 weeks. Set out in May. Some are tall upright plants, others stemless, a few, trailers. The 'evening primroses' open in late afternoon with startling rapidity and attract nocturnal moths. The 'sun drops' open in the daytime. The flowers are often delicately perfumed. The perennials make nice clumps with age. They are variable and prone to mutation, and have been used in studies of evolution. The genus name is said to come from the Greek meaning 'wine-scenting' or 'wine-hunting', referring to the ancient use of the roots to flavor wine, or the more recent use of the roots of O. biennis eaten after meals with wine, as olives are today. They have a history of edible and medicinal use, and are the object of current research. The oil of the seed of O. Lamarckiana, biennis and others contains gamma-linolenic acid, (GLA) formerly found in substantial amounts only in human milk. GLA is involved in biosynthesis of prostaglandins, and there have been many claims for its effectiveness in treating a variety of ailments from obesity to hangover, high serum cholesterol, schizophrenia, and multiple sclerosis. 'EVENING PRIMROSE'. Sweet-scented lemon yellow 1 - 2" flowers open in the evening. Hardy biennial or annual to 3 - 6 feet, with large rosettes of lance-shaped basal leaves. E. N. America. Zone 3. The thick roots are edible, with a sweet, parsnip/salsify flavor, harvested at the end of the first season. Young leaves and shoots eaten as a potherb, the flowers added to salads, the young pods eaten, and the seed oil is rich in GLA. Surface sow, to germinate in 1 - 3 weeks. —Oenothera Lindheimeri: See Gaura Lindheimeri. 'DESERT EVENING PRIMROSE'. Bright butter yellow 2 - 3" flowers fading to reddish, with long slender tubes. Biennial or perennial to 3 - 4 feet, with a rosette of 8" leaves. Southwestern deserts. Germinates in 1 - 4 weeks warm. "The only possible alternative to being either the oppressed or the oppressor is voluntary cooperation..."—Errico Malatesta. LEGUMINOSAE. Eurasian and African plants. 'SAINFOIN', 'HOLY CLOVER'. Pink 1/2" flowers with dark stripes, in 4" spikes. Hardy perennial to 2 1/2 feet, with pinnate leaves. Eurasia. Zone 3. Nitrogen-fixing and drought-resistant. Excellent bee plant, producing superior honey. As forage it protects ruminants against nematodes, increases protein utilization, and prevents bloat. Sow whole pods to germinate in 1 - 2 weeks. CACTACEAE. Cacti ranging from British Columbia to the tip of South America. 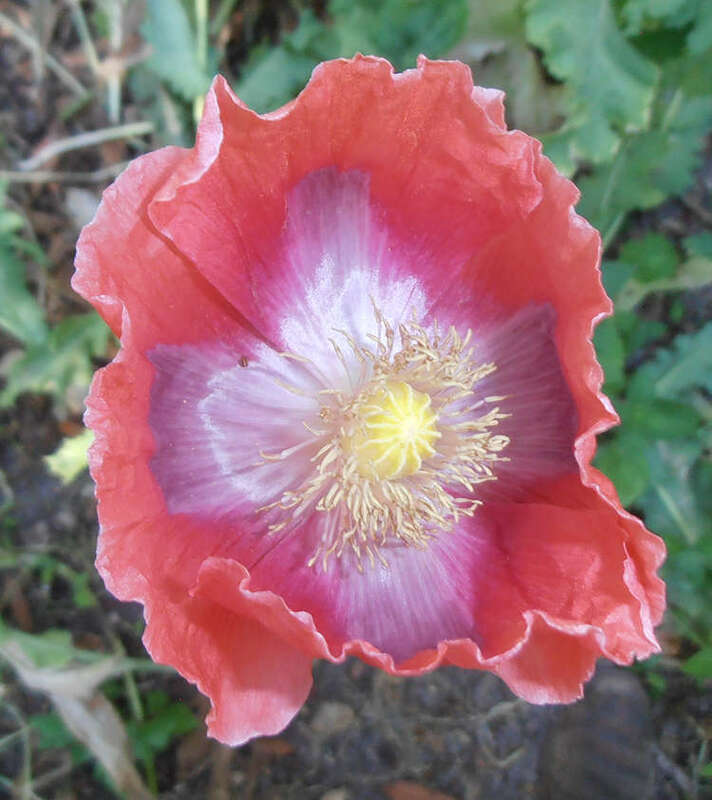 Most are 'prickly pears', with flat, oval pads, showy flowers, and red, yellow, or purple edible fruits. Fast growing and adaptable, some are hardy to 45°F below zero. Likes heat, sun, and good drainage. Seed often are helped by nicking, cold treatment, or fall sowing. Many germinate quickly with GA-3. 'CACTUS APPLE', TEXAS PRICKLY PEAR'. Bright yellow 2 - 3" flowers in early summer, followed by abundant edible dark purple 2" fruits. Large 'blue-green foot-long pads. Quite hardy, this seed collected in Zone 7 Tennessee. Germinates in 2 - 12 months. Yellow 3" flowers with reddish or purplish centers. Pear-shaped 2 - 6" pads forming prostrate clumps 3 feet wide. South Dakota to Michigan to Texas and California. Zone 4. Forms potato-like tubers on the roots. Try GA-3 to germinate, hold pots. LABIATAE. Easily grown annual and perennial herbs popular for kitchen seasoning and ornament. Best in full sun and warm, dry, well-drained soil. Sow on the surface to germinate in 1 - 2 weeks or so. Seed viable 3 - 5 years. Classification a bit confused. 'GREEK OREGANO'. Aromatic hardy perennial to 18". Called the best oregano for cooking, going well with tomato sauces. SE Europe. Easy in full sun and poor dry soil. Germinates in 1 - 3 weeks. GA-3 helps. 'SWEET MARJORAM'. Aromatic tender perennial to 2 feet. Tiny white or lilac flowers in summer. Zone 6. Much used in soups, stews, with meats, etc. LILIACEAE. Widely distributed Eastern Hemisphere bulbs. The hardy kinds are fairly carefree and good for naturalizing and wild gardens. Tender species good in pots in the greenhouse or in California. As good as tulips and freesias in pots. Good cut flowers. 'PREGNANT ONION'. White starry 3/4" flowers in long racemes on snaky green stalks. Large above ground bulbs to 6" wide, which sprout small bulbs from the surface. Long fleshy leaves. South Africa. (=Albuca bracteata) Germinates in 2 - 4 weeks. GRAMINEAE. Slender Western American perennial bunch grasses grown for ornament, forage and their edible seed. Fresh seed is dormant and does best with 4 weeks cold treatment or light scarification. Old seed gives the best germination. In nature, rodents help the plant by storing the seed, which has been scarified by their teeth. "It is advisable to store for at least one year before planting, and the seed can be stored safely for many years. "—Wheeler and Hill, in 'Grassland Seeds'. 'INDIAN RICEGRASS'. A native Californian bunch grass, forming dense tufts to 2 feet tall, the spikes bearing dark edible seed. W. U.S. Zone 3. The seed was gathered in large quantities and eaten by many tribes in the Western States, ground into flour and made into bread. A valuable livestock forage, over-grazing has seriously reduced native stands. Excellent food plant for arid regions. LEGUMINOSAE. Australian shrubs, good in California. 'AUSTRALIAN HOLLY'. Bright yellow 1/2" pea-like flowers with red markings, in spring. Shrub to 5 - 10 feet, with prickly, holly-like, shiny, dark green 4" leaves. Rocky soil, Australia. Zone 9. Has really neat leaves. Nick seed or use hot water to germinate in 2 - 12 weeks. "True social harmony grows naturally out of solidarity of interest..."—Emma Goldman. PAEONIACEAE. Hardy and long-lived perennials or shrubs from thick roots. The species come true from seed and are interesting to grow, blooming in about 3 years. Any soil, but dig deeply. 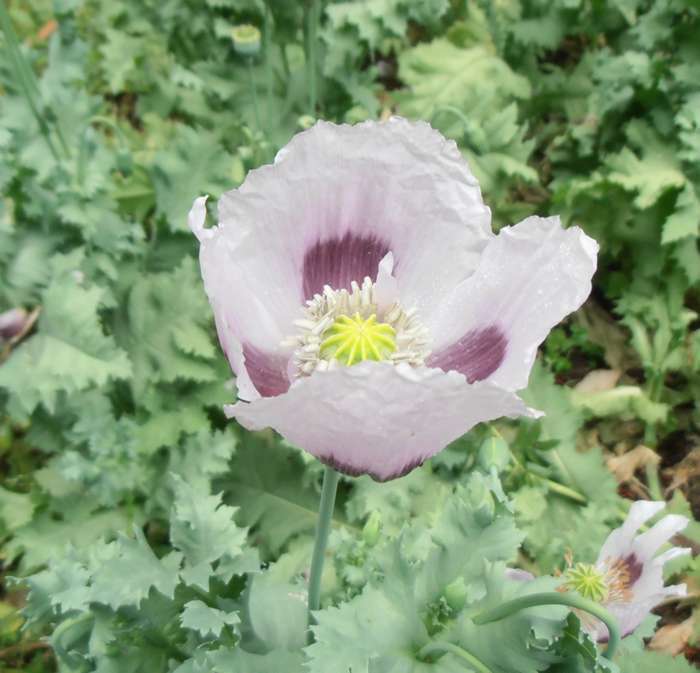 Herbaceous kinds bloom best in cold climates. Sow spring to fall, root germinates in 1 - 8 months, top growth emerges the next spring. Year-old seed often germinates best. Always hold pot over at least one year in a moist shady spot. Seed viable 3 - 4 years, giving good germination. BAI SHAO', 'CHINESE or GARDEN PEONY'. Fragrant white to pink or red 3 - 4" flowers in June. Hardy perennial to 2 - 3 feet, with divided leaves. Siberia to China. Zone 5. Roots were eaten by north Asian nomads, and the seeds powdered and added to tea. Used in Chinese medicine. Root germinates in 2 - 6 months warm, then needs a cold period for the leaf to germinate. 'TIBETAN PEONY'. Golden yellow 3 - 5" wide flowers in May and June. Hardy shrub to 6 - 9 feet, with attractive divided leaves. Tibet. Zone 6. Sow in summer or fall, or give 1 - 3 months warm, then cold. 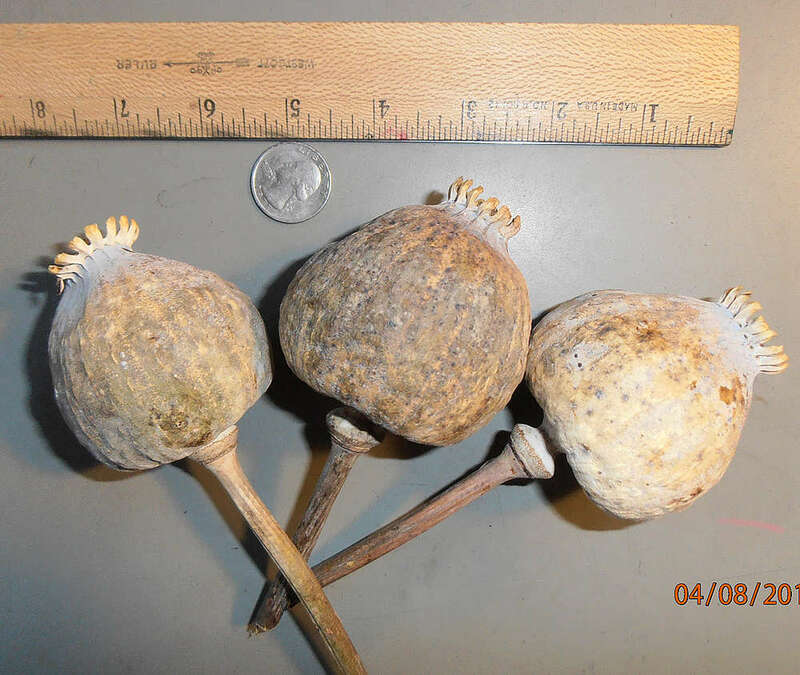 PAPAVERACEAE. Widely distributed annuals, perennials and sub-shrubs. 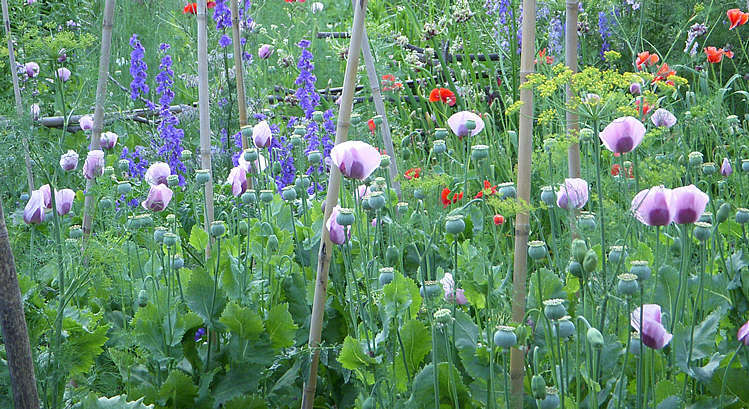 Well-known garden favorites with brilliant showy flowers and attractive pods. Easily grown but many resent transplanting. Most like hot, sunny, well-drained spots. Sow on the surface, often germinating best at cool (50 - 60°F) temperatures. GA-3 improves many. Seed viable 3 - 25 years. 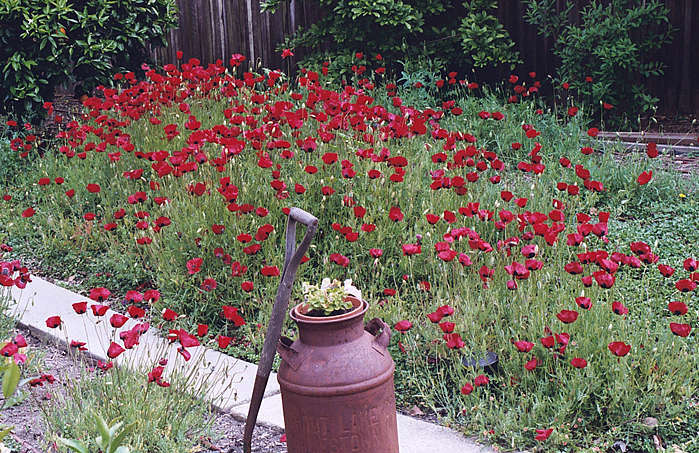 It has been said that no other plants have eased so much human suffering, or caused so much, as the poppies. Most germinate in 1 - 4 weeks. 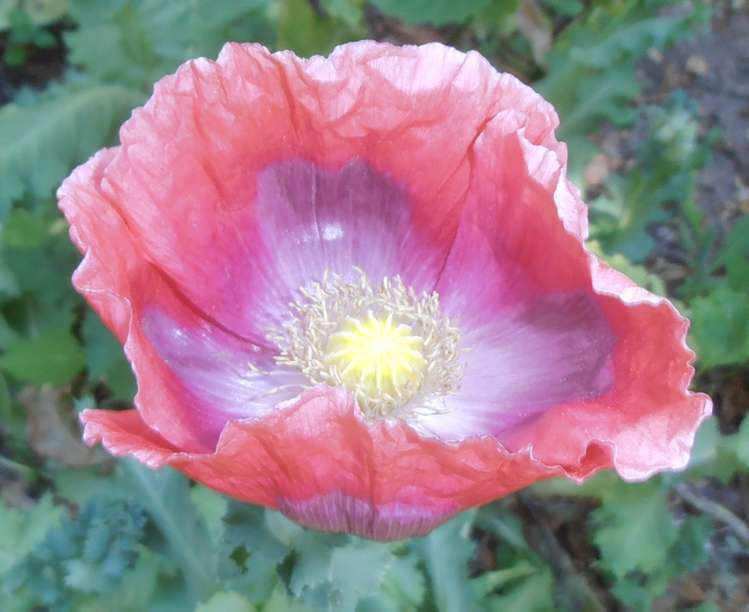 'ALPINE POPPY'. Fragrant 1 - 2" flowers in bright shades of yellow, rose, orange, and white. Very hardy tufted perennial to 10", with finely divided lacy foliage. Alps. Zone 5. Germinates in 2 weeks. Stunning deep scarlet 2" flowers with black spots at the base of each petal. Very free flowering annual, excellent here in California. Brought from Greece by my father in his coat pocket. Germinates in 1 - 3 weeks. A fine formula mixture. To 3 feet. Zone 3. 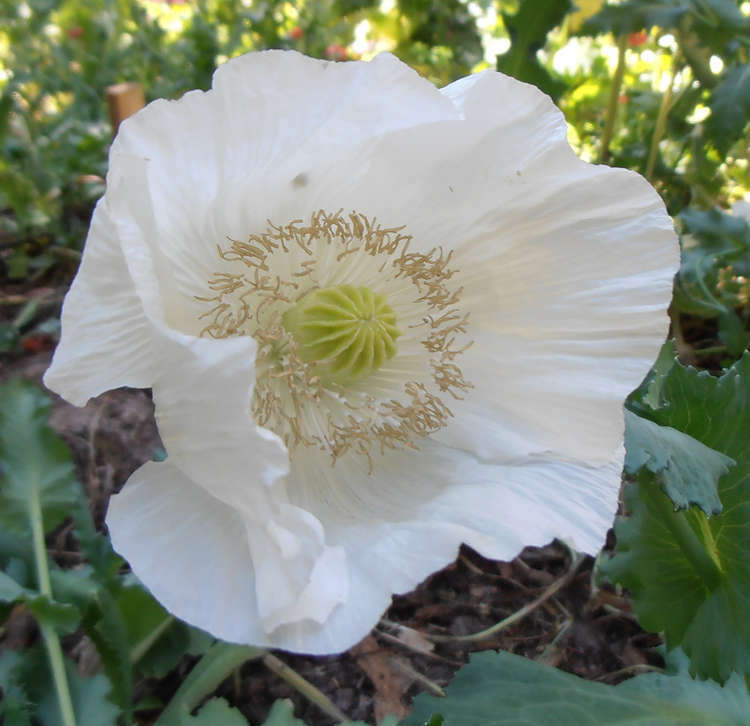 Large pure white flowers with black centers, on a hardy perennial to 2 1/2 feet. Zone 3. Absolutely stunning and choice! Also called 'Black and White'. 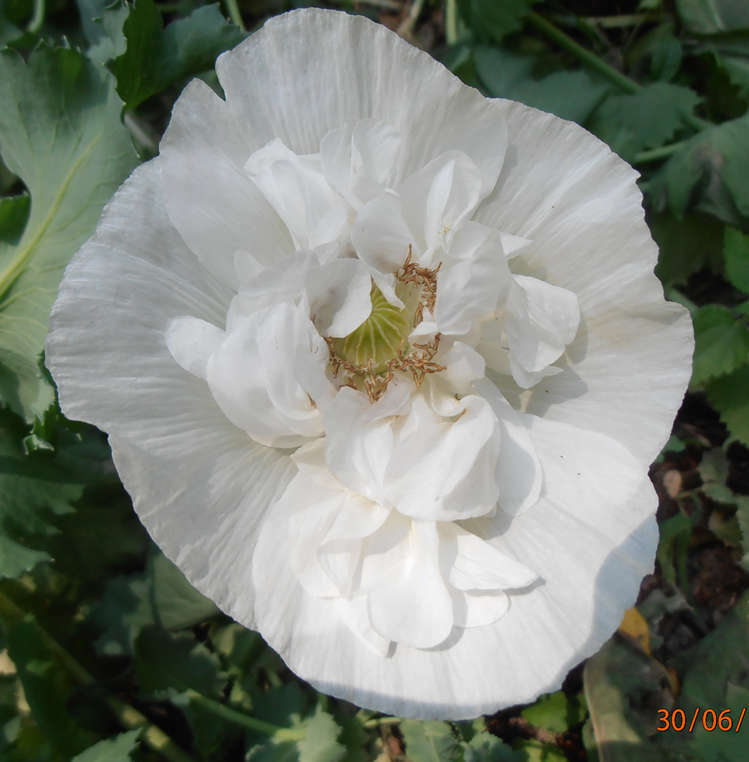 Large double white flowers with round petals, some semi-double, and a few single white. Hardy annual to 3 feet, with large ornamental pods. Nice! Germinates in a week. Pastel shades of mauve, pink, white, grey, and lilac, some edged or blended, with delicate traceries of darker veins. Originally developed by Sir Cedric Morris of Suffolk. Single flowered types in a range of colors. To 30". 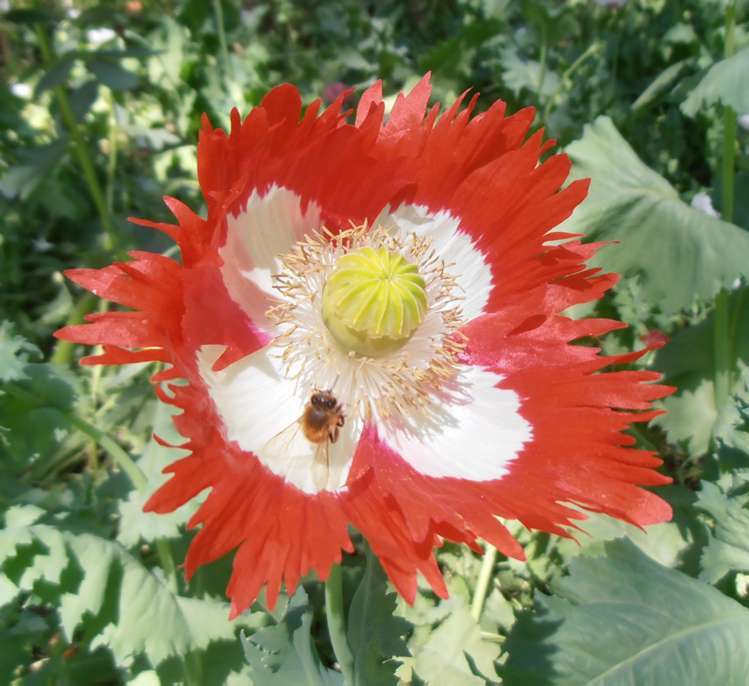 'CORN POPPY'. Striking deep cinnabar-red 2" flowers with a black blotch at the base of each petal. Hardy annual to 3 feet, with pinnately divided leaves. Eurasia. The original form of an important species with over 30 botanical varieties and innumerable horticultural forms. 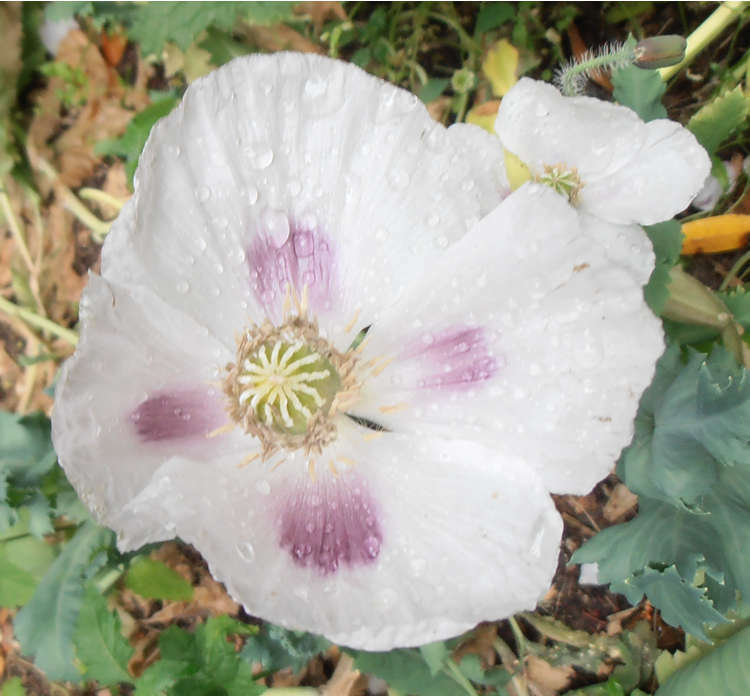 The seeds are used on cakes like ordinary poppyseeds, but have their own flavor. A fine oil is expressed from them, being valued like olive oil. 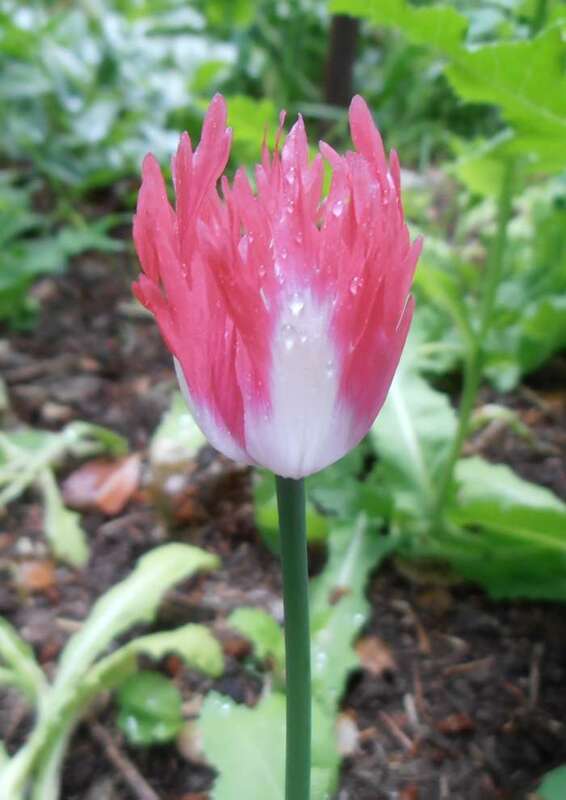 The petals were made into a deep red syrup, used to color soups and other foods. 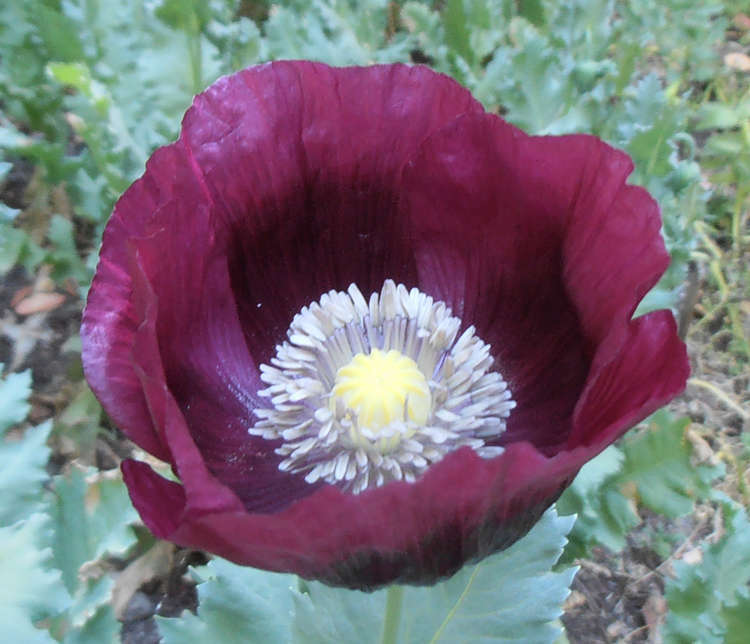 'AFGHAN POPPY'. A nice mix of forms, mostly a beautiful pink with white centers and laciniated petals. Some with round petals and gives some beautiful color variations like purple and scarlet. Nice! Annual to 3 feet. Originally from Afghanistan. I have reselected this to have a larger proportion of the better colors, and fewer pink. I hope you like it! A superior strain. Fully double flowers with fringed petals, in deep purple with wine tinges. Nice! Germinates in 1 - 3 weeks. 'DANISH FLAG', 'DANISH CROSS'. 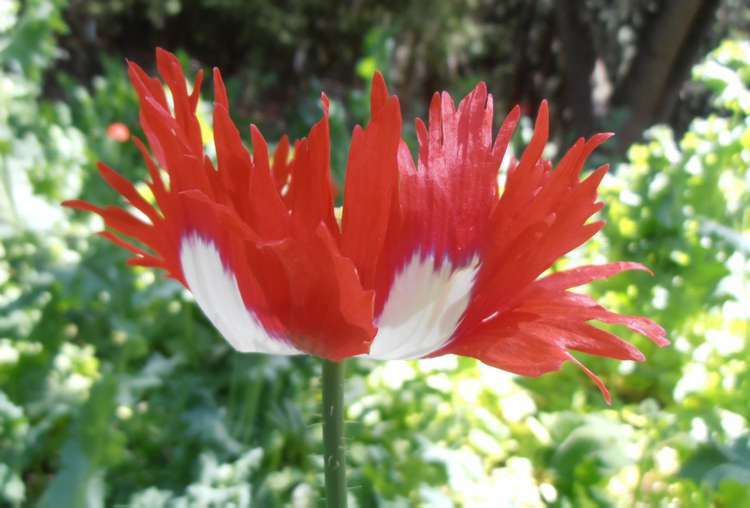 This is the famous variety with large, single, pure brilliant scarlet 3 - 5" flowers with a pure white cross in the center, and with fringed-edged petals. Hardy annual to 2 1/2 - 5 feet. 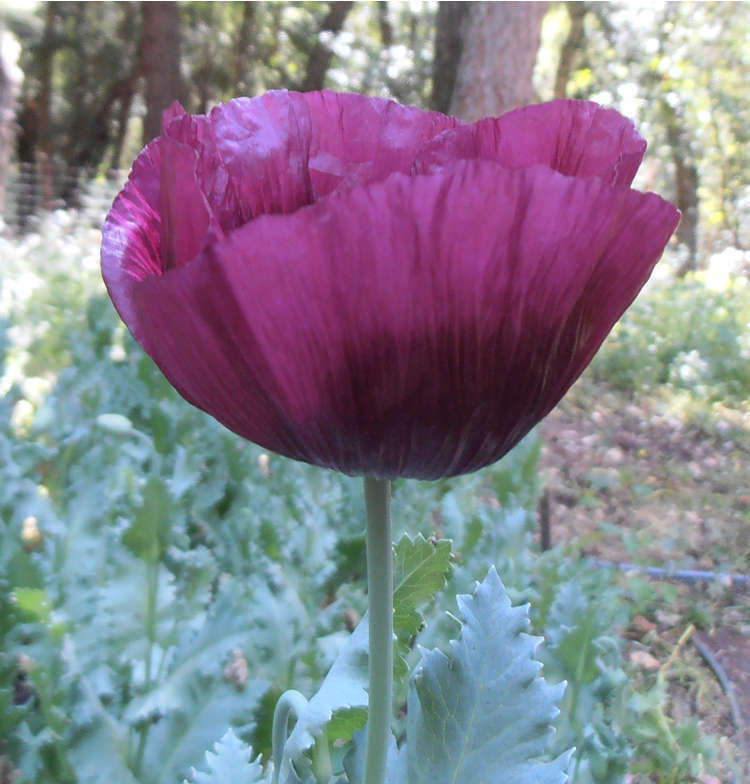 Absolutely one of the most stunning poppies, this is an antique variety over 100 years old. My favorite. Germinates in a week or two. Specially-selected florist strain, developed for the huge pods used in dried arrangements. Large salmon-pink flowers with large purple and white cross. Hardy annual. Germinates in a week or so. Odd pods with a large central pod surrounded at the base by several tiny pods, the 'mother hen and her chicks'. Unusual in dried arrangements. Produces a good percentage of the hen-and-chicks type pods, with some regular-type pods. Large salmon-red flowers with purple cross. Annual to 3 - 5 feet. Germinates in 1 week. White flowers with purple centers, followed by attractively flattened pods. From Izmir Turkey. Noted for the very large number of flowers and pods per plant, often 20 or more, and for the distinctive blue-green foliage. A superior strain. Large deep purple 4" flowers shading out to a lighter edge. Distinctive small round handsome pods. Hardy annual to 5 feet, with a large number of flowers per plant, and attractive, superior pods. Multiple flowers per plant - we've had over twenty on one plant. Seed needs a few weeks prechill, or sow in fall. Large fully double flowers with fringed petals, in a nice lilac shade. Germinates in 1 - 3 weeks. Striking long pods about 3" long and an inch wide. Unusual and excellent for the dried floral market. May include some round forms. Germinates in 1 - 3 weeks. Single pink-lavender flowers with a darker blotch. Sturdy plants to 4 feet tall, blooming in late June and early July. "I first collected seeds of this plant from the garbage pile at Monet's garden in Giverny, France in the late 1990s."—Aiello. Seed needs cold, prechill or sow in fall or very early spring. A nice strain with extra large plants and a variety of color forms, varied petal and pod shapes, and even a few pods blushed purple. 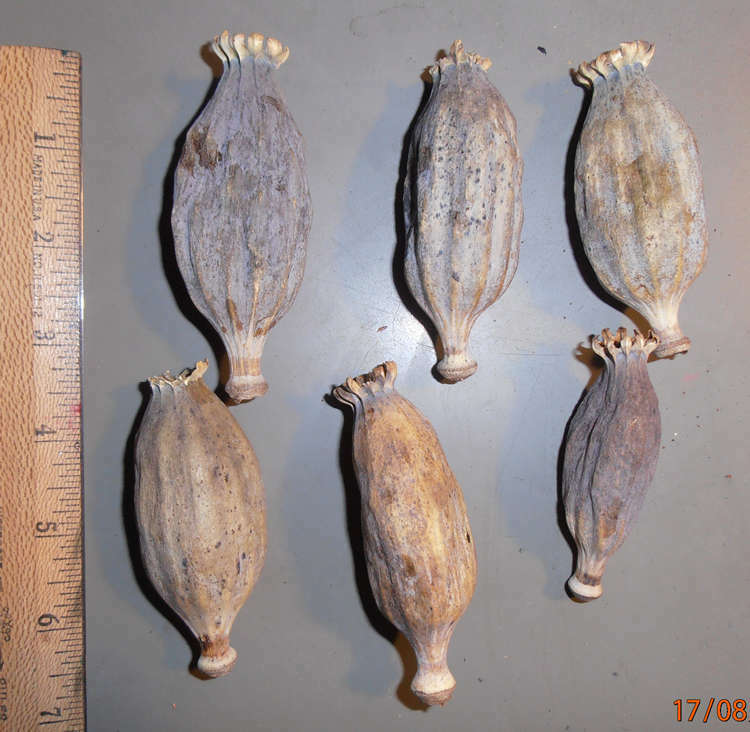 Handsome large pods which open when ripe to shed the seed, providing a dual crop, edible seed plus pods for the dried flower market. Large white flowers with light purple cross. Annual to 3 - 5 feet with bristly stems. Germinates in 1 week. PASSIFLORACEAE. Showy tropical tendril-climbing vines grown for the unusual flowers and often edible fruits. Good in the greenhouse. Best in a rich fibrous soil and given plenty of manure and water while growing. Warm temperatures and nicking the seed often helps germination. Often a day or so of 110 - 120°F may trigger germination. 'YELLOW GRANADILLA', 'YELLOW PASSIONFRUIT', 'LILIKOI'. Tender, vigorous climber to 30 feet. Flowers 2" across, white with a curly, white banded purple corona, produced all summer. Leaves deeply 3-lobed, glossy. Fruits yellow, 3" long, with orange flesh. Brazil. Grown more for the delicious fruit than the flowers. Good in beverages, sherbet, etc., and is high in vitamin C. Zone 8. Fruits best with two vines. Germinates in 1 - 16 weeks depending on temperature. 'MAYPOPS', 'WILD PASSIONFLOWER'. Cream or yellowish 2" flowers with purple or pink corona. Yellow 2" edible fruits. Hardy perennial vine with 3-lobed leaves. Virginia to the Tropics. Cultivated by the Indians. The hardiest species, to Zone 5 or 6 if given a heavy mulch. Medicinal. Irregular germination. Give 8 - 12 weeks cold treatment. 'PINK BANANA PASSIONFRUIT'. Rampant evergreen climber, with soft green, deeply 3-lobed foliage. Pendant, long-tubed, 3" wide pink or rose flowers up to 5" long. Yellow 3" edible fruits. Andes. Zone 8. Extremely fast growing, good for quick cover. Germinates in 3 - 12 weeks. BIGNONIACEAE or SCROPHULARIACEAE. Ornamental Chinese deciduous trees somewhat resembling Catalpa, grown for their large, showy clusters of beautiful foxglove-like flowers. Best in deep loam in mild climates, will thrive and flower as far north as New York, and are root hardy to Montreal. Excellent shade trees. Very fast growing when young, and used as pulp, cabinet and firewood. Easy from seed. Sow on the surface as light helps. Germinates in 2 - 3 weeks (up to 20 weeks). Seed gives high germination for more than 4 years. 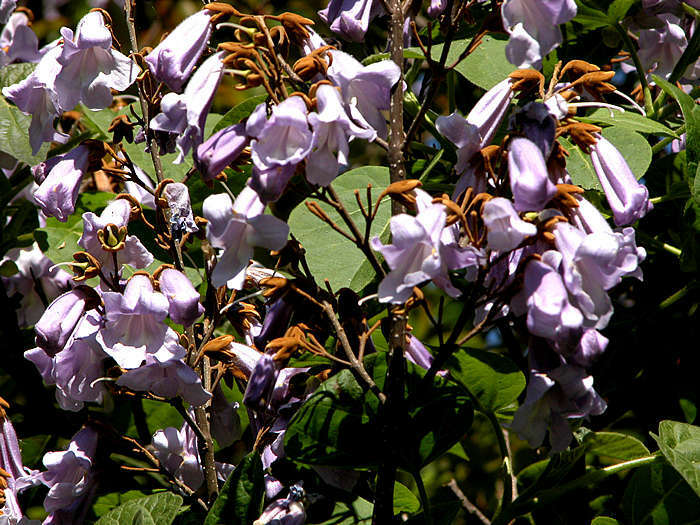 'EMPRESS TREE', 'ROYAL PAULOWNIA'. Showy, fragrant, 2" long, pale violet-blue foxglove-like flowers striped yellow and spotted inside, in large upright pyramidal clusters to 10" long in April and May, before the leaves have fully emerged. Top-shaped pods. Large, tropical-looking velvety foot-long leaves. Fast growing to 30 - 70 feet. China. Zone 5. The wood is used for cabinetry, fenceposts and houses in China, where the flowers are fed to swine to fatten them, and the tree has many medicinal uses, and the leaves are used to wash hair to restore its color and thickness. Germinates in 2 - 3 weeks, best with light.